Julie Goucher from Anglers Rest blog has been running a series called The Book of Me for some time. My good intentions came to naught some time ago and I haven’t written on many of the topics. This week’s topic, though, is about “your first home” and Julie has given us free rein to interpret this any way we like, and it seems I’ve gone off for a gallup. I’ve written previously about my grandparents’ house and a little about my home growing up, but today I thought I’d like to share with you the story of our first home together as a married couple. It’s turned into a long yarn, so take a tea break and settle in for a read. Mr Cassmob and I married many decades ago in suburban Brisbane. Two weeks later we flew to the then-Territory of Papua New Guinea where he had grown up and had a job with the Education Department in Alotau, Milne Bay. The departure at Brisbane airport was wrenching and full of tears all round – I have a clear memory of one of my male friends from uni standing with my girlfriends weeping on each shoulder. Port Moresby was to be our first stop on my first “proper” flight. I was “armed” with my new entry permit, issued in my married name, probably the first such document, come to think of it. The heat hit with a soggy smack as we disembarked the aircraft and I remember smell of the tropics, and that the local ground crew were dressed in lap-laps. Absolutely nothing was the same as I was used to and it was all such a massive change after my life in a working class Brisbane suburb. We spent a few days in Moresby with my sister-in-law who was then studying at the new University of Papua New Guinea but we were keen to get on with our new life together. 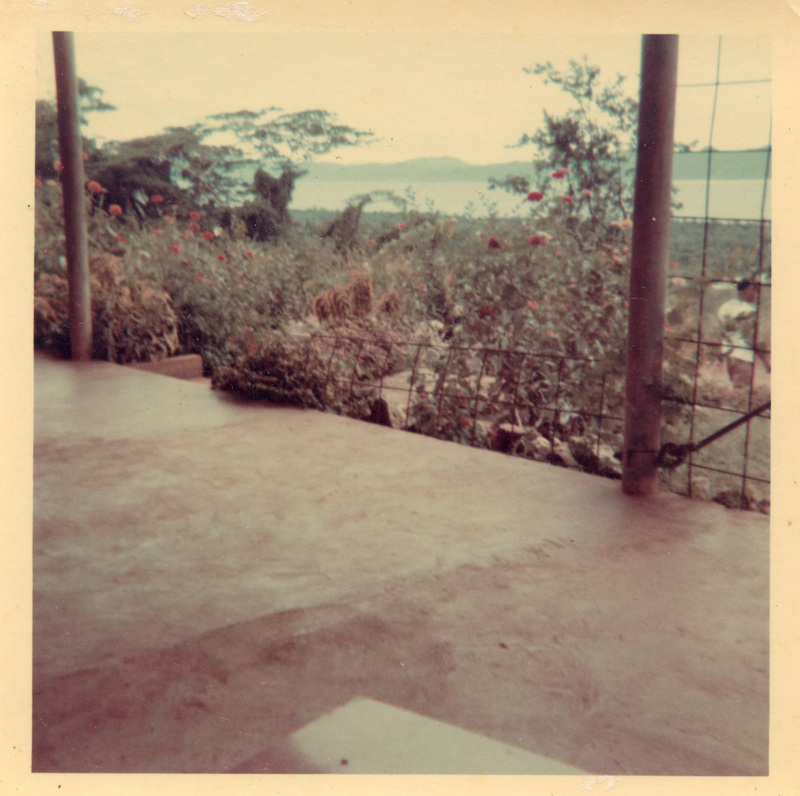 The view of Milne Bay from the relaxation area under the house, circa 1968. We flew into Gurney airstrip in Milne Bay in a Piaggio aircraft, a cosy nine-seater, though that would have been pretty squashy. For once, luckily, we were the only passengers and the weather was clear that day[i]. We collected our luggage from the bush-materials shed which served as the arrival hall. I remember our drive into the town of Alotau from Gurney through dense trees with glimpses of the Bay and occasional villages, crossing the three or four unbridged creeks that were part of the journey. And then we were there…our new home! Strangely I found Alotau much less confronting than Moresby even though it was such a small town of a few hundred people and an even smaller expat community. I guess the magnificent scenery went some way to mitigating the rest of it. 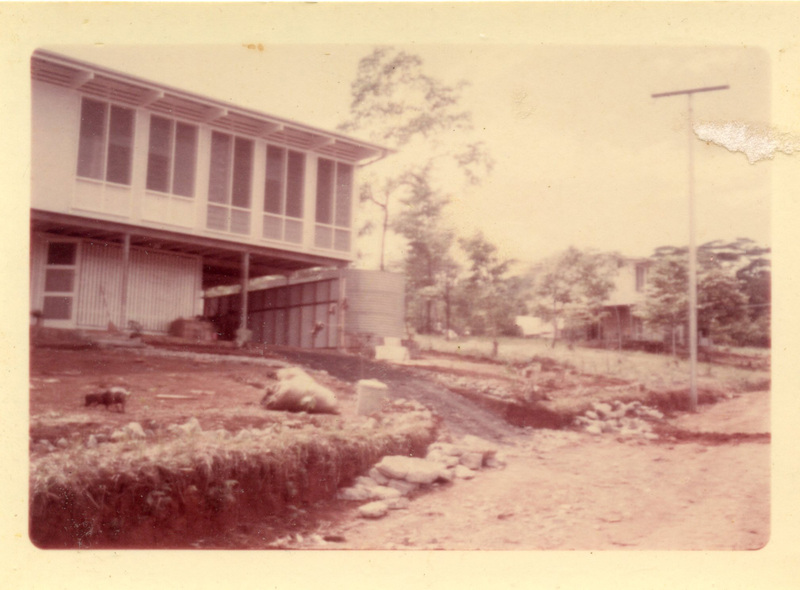 We were to spend our first months as a couple in the house of my parents-in-law, who had been posted to Moresby for a few months (why, I don’t recall). In most respects it was a typical government-issued house of the era, and very like Darwin’s high-set houses. 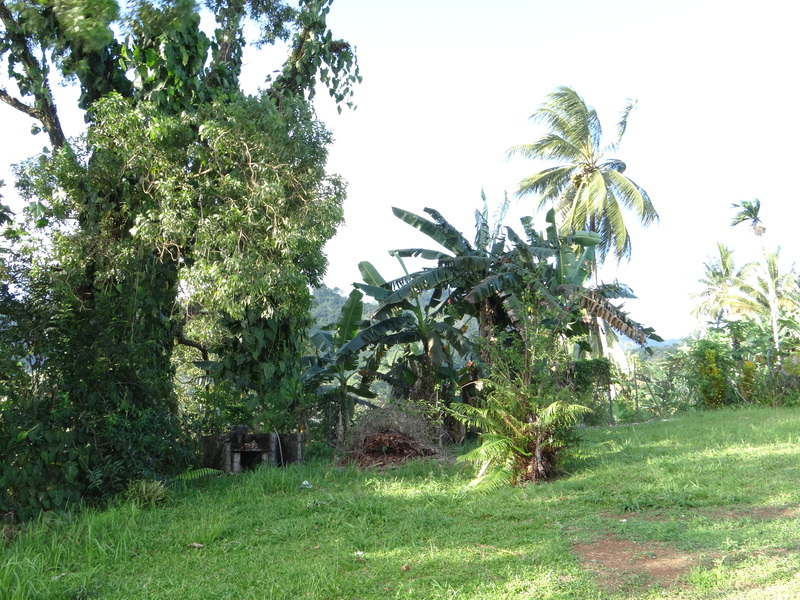 What was unusual was its spectacular location with a view over Milne Bay. 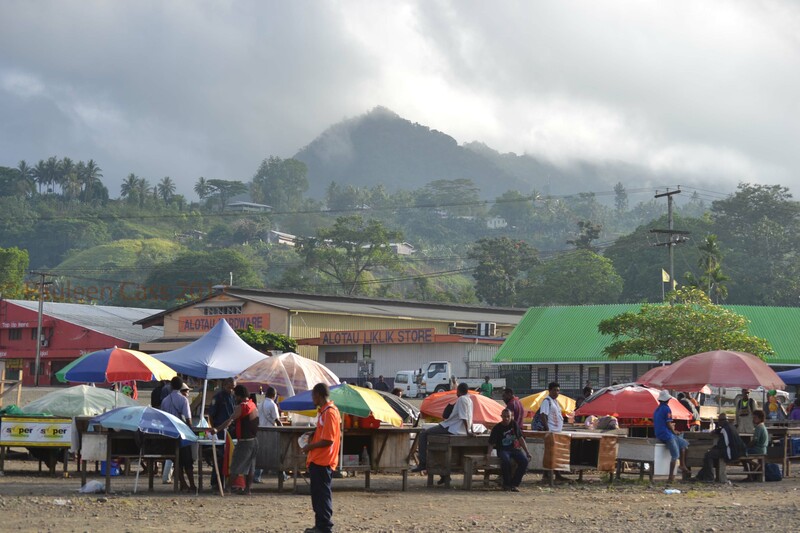 Alotau was a newly-established town, purpose-built when the government decided to move the Milne Bay District headquarters from the island of Samarai to the mainland. The Education Department had an allocated government trawler, used to do school inspections in the remote far-flung islands of the district, for which Mr Cassmob Senior was the District Inspector. As such he was able to choose where their house would be built in Alotau… sounding a little colonial? The story goes that he took the trawler up the bay and pointed to a fabulous spot with views of the Bay in front and, at the back of the block, of the cloud-draped mountains. Only the District Commissioner had a better view <smile>. The house itself was on metal stilts to catch the breezes, reminiscent of many Brisbane houses but much more open and more “flimsy”. Louvres ran the length of each room and were floor-to-ceiling. At the lower level they were metal louvres, but at the top they were glass. The walls were a fibro-like construction and the floors were beautiful polished timber. The kitchen, dining room and lounge were essentially an L-shaped open plan with the stairwell coming up adjacent to the kitchen wall. It had three large bedrooms and a bathroom with a basic shower. NOW: The old Cass home in Top Town, 2012. 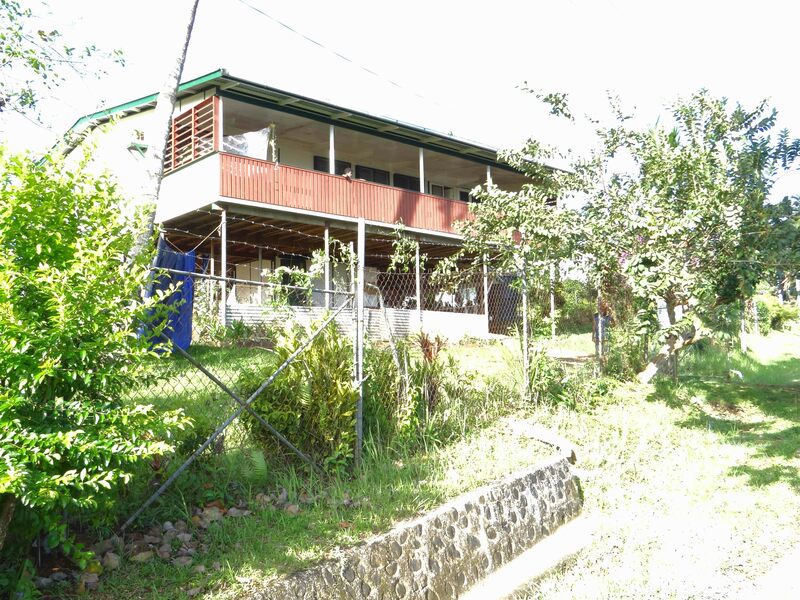 The verandah upstairs is an addition as is the fencing on the bottom level. Government houses were issued with furniture from Government Stores. It was perfectly functional but would never win any design awards. Simple aluminium tables and chairs, ditto the beds, and a reasonable but basic lounge suite. Mr Cassmob Snr was skilled with his hands and had made some lovely wooden bookcases and coffee tables. Most of the houses were of similar designs which made it easy when you moved from one place to another – just put everything where it “belongs”. You made the house your own by the memorabilia and decorations you used and the soft furnishings you’d sewn. It it was always interesting to visit someone else’s house to see their style…and you never had to ask where the bathroom was <wink>. 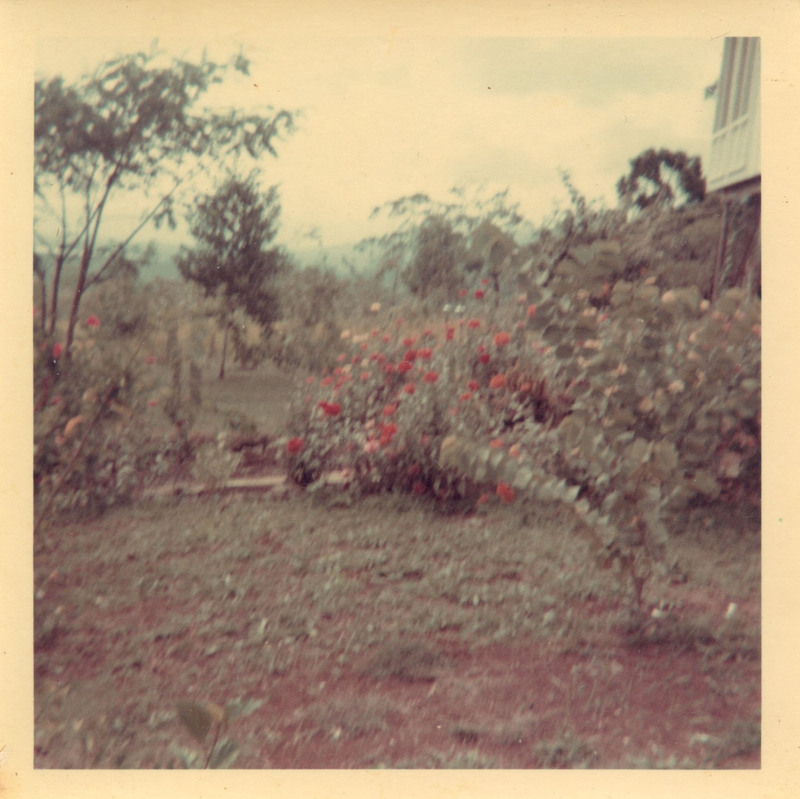 THEN: Part of the much loved gardens 1960s – 1970s. One humungous difference from my earlier life was that, along with the borrowed house, we had house staff. Poor Jimmy….what a challenge he had with the new sinebada[ii]….I probably drove him demented. I had known in advance that the kitchen oven was a slow-combustion stove so I’d asked my aunty Bonnie, who knew about these things, how to work with them. She had told me that I needed to keep the heat pads down (or was it up?) on the elements to keep the heat in. Jimmy had the opposite view so we spent weeks putting them up and down in turns. How ridiculous! I should have just let him get on with it! On the up side he also chopped the wood for the oven so we didn’t have to worry about it until our next house when we chose not to have house staff. NOW: You can glimpse the mountains at the rear of the house. Sadly the hibiscus plants are no more. Taken 2012. Under the house was an open space with a relaxing area where we’d have an evening drink and nibbles, a Cass family tradition. Around the back of the stairwell was the open-air laundry with its high-tech twin tub washing machine. Mrs Cassmob Senior was a mad-keen gardener and their garden was a delight. She had lots of hibiscus growing and had even imported some from Hawaii, especially a lovely lilac one. She passed her love of flowers on to her children so I have her to thank for the flowers I’m given regularly. 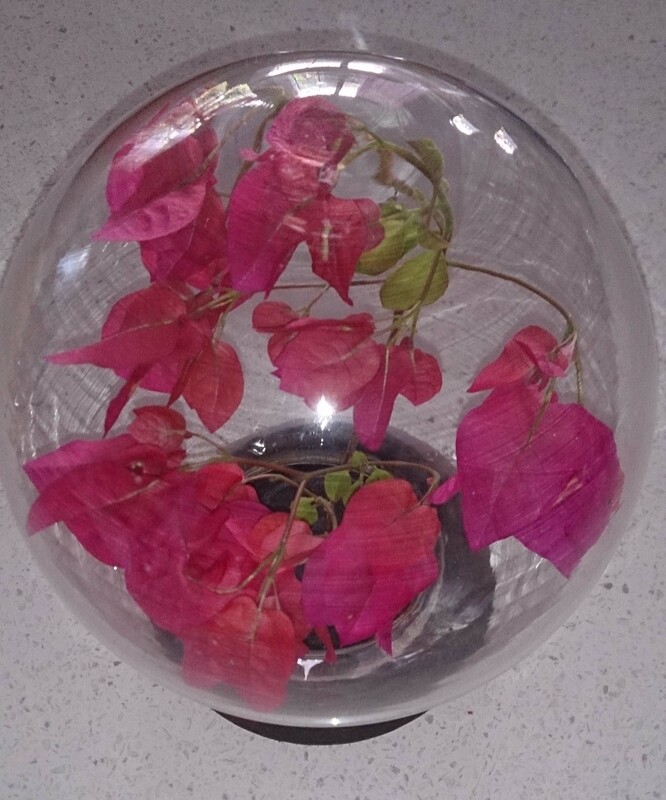 Each day Jimmy would pick a hibiscus and put it in the upside-down fish-bowl-vase on the dining table. Bougainvillea not hibiscus, but you get the idea. her own job as a teacher at the primary school across the road. Nowhere in PNG had television as well so our entertainment was self-driven, or a movie at the Cameron Club (don’t get excited, not as flash as it sounds). There were no restaurants so we had friends over for dinner and vice versa. There were four trade stores with a minimal variety of items, rather like something from an old Western-style movie. No department stores like TC Beirne’s, David Jones, Myer or McWhirter, no walking from the Valley to the City looking at which particular item suited best. Doing some sewing on my mother-in-law’s machine? Need cotton? Don’t worry about colour matching – choose between black and white and maybe one or two other colours. This shows the main street of Alotau in 2012 with far more shops than were there in our day. Above the power lines you can see the line of houses where the Cass family lived…theirs used to be the last one in the street. Major groceries were ordered in by mail from Samarai, where the “big” shops were still based because of its place on the shipping lanes, and they came in to us by trawler. Meat and other freezer goods were ordered from Moresby and came in by plane – when the clouds weren’t socking in the bay. You can imagine the potential for confusion with three Cass families spread around PNG – we’d wind up with each other’s freezer accounts…and as for our government staff files! 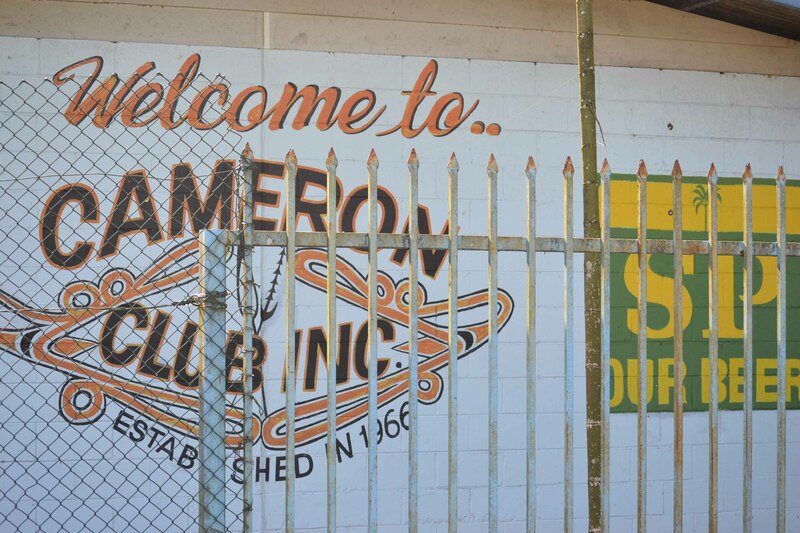 The Cameron Club promoting everyone’s favourite tipple. We used to go to part-open-air movies here weekly. The Alotau power system was only on for 18 hours a day so we also had kerosene lamps, and torches, handy for the hours between midnight and six. We would have to rush home from the movies at the Cameron Club to get the coffee made before the power went out. Although the phone system had recently progressed from the previous radio telephone (over), it was erratic, expensive, and unless you wanted to share your conversation with the whole street, not worth bothering with. Instead I wrote regular lengthy letters to my parents and friends back in Brisbane. Unfortunately I have none from those early days, not even the first letter of 19 pages I wrote to Mum and Dad. And did I mention that in those early months, during the Wet Season, mail didn’t arrive when the plane couldn’t get in? So much of that time disappeared from my memory in the overwhelming changes that I was adapting to and I really wish that I had some of those letters to remind me, or had written a diary. Before that first year was out I had come to love Papua New Guinea despite its challenges…it had become home. This was part of the reason we made a trip back in 2012…always risky to revisit a place but we still loved it. You can read some of those stories here, here, and here. A long story from me, as always, and not just about our first house, but as with family history generally, it’s about context. Milne Bay women dancing at the Kenu and Kundu Festival, Alotau 2012. [i] Flying in PNG is notoriously risky as this website shows http://aviation-safety.net/database/dblist.php?Country=P2. 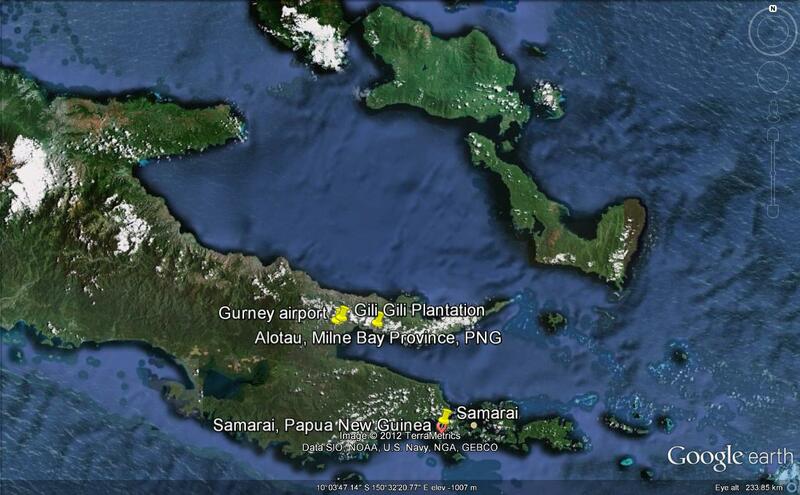 Strangely it doesn’t include the one in Milne Bay that occurred soon after we arrived there. [ii] Roughly translated, a white lady, now more often called dimdim. 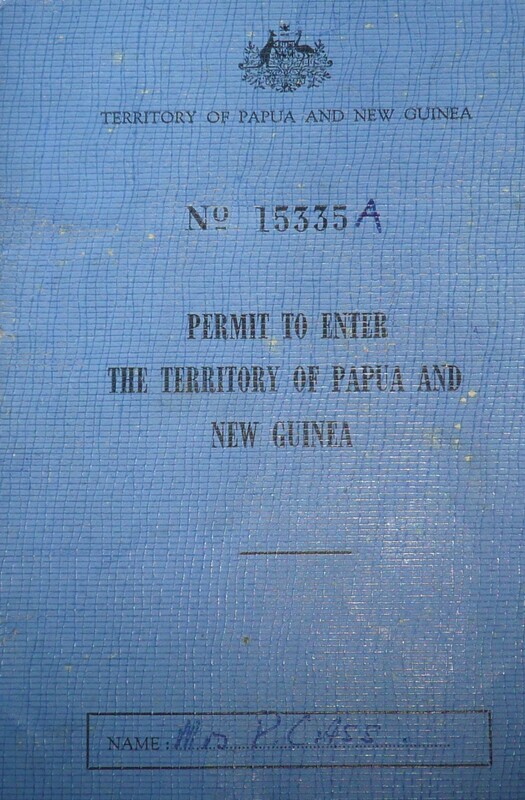 This entry was posted in Book of Me, Cass family history, Papua New Guinea and tagged Milne Bay by cassmob. Bookmark the permalink. Had to make do with my bottle of water Pauleen, the barista is busy in the garden. Thanks for giving us a glimpse into your past that is so very different from mine. The Cassmob descendants are so lucky to have the bank of beaut stories you are building up for them. You can’t get good baristas Jill 😉 I think we all have special stories about our own history and each will be different. I do hope the descendants appreciate the stories as time goes on. I absolutely loved reading this one Pauleen!!! The photos and descriptions made me feel like I was there. It reminds me of when I worked as a governess on sheep and cattle stations in the 80s and wrote to my Mum each week. Thankfully she kept all my letters and I kept all of hers so that I can read back through them whenever I want. A sheep station where I worked in NSW still had a party line phone system which I found funny and quaint. Thanks Kylie! I do wish Mum had kept my letters though. I think you’ve got a blog post there in your own story too…I’m sure there’d be some funny stories about the party line phone. Peter actually proposed to me over the radio telephone…can you imagine?! I loved reading this. Despite my sitting in my breakfast room eating toast and drinking tea, I felt like I was a fly on the way, observing your early life in PNG. Whilst it is a shame that those early letters have not survived, you have captured those early moments beautifully. Thanks Julie…I’ll bet it was a bit of a difference from outside the window 😉 Yes, I I regret those departed letters too. I loved the coffee break… but no wonder you empathise with our pioneers… certainly different times, but great to look back on. My grandmother had a party line, but she enjoyed speaking Greek as soon as she heard the click… she said loved the muttering, which she called muddering, then all the quick clicks that followed. Thanks for visiting Jen and your kind comments. It was something of a culture shock as well as the homesickness but I grew to love it very quickly.